Though Americans greedily consume all sorts of German chocolate, one type is strictly off-limits in the USA. Beloved Kinder Surprise (Kinder Überraschung, auf Deutsch) is an iconic sweet for German children but cannot be sold int he USA. Discover the history of this not-really-German candy, why it isn't sold in the USA, and what makes it so special. Considering their popularity in Germany, it is surprising Kinder chocolates are not native to Germany. The word "Kinder" means "children" but Kinder chocolates actually come from an Italian company called Ferrero. This brand is better known for their addictive hazelnut spread Nutella, plus other favorites like Ferrero Rocher, Mon Chéri and even Tic Tacs. The Ferrero family recognized that German brands catered to adults with their chocolates, but not the children. Pietro Ferrero rectified that oversight with a series of children themed chocolates in the late 1960s. To win over the parents, these lines were made without preservatives or food coloring as they are today. What is a Kinder Surprise? The fact that Kinder Überraschung are not from Germany has not dampened the country's enthusiasm for the treat. And they aren't alone. 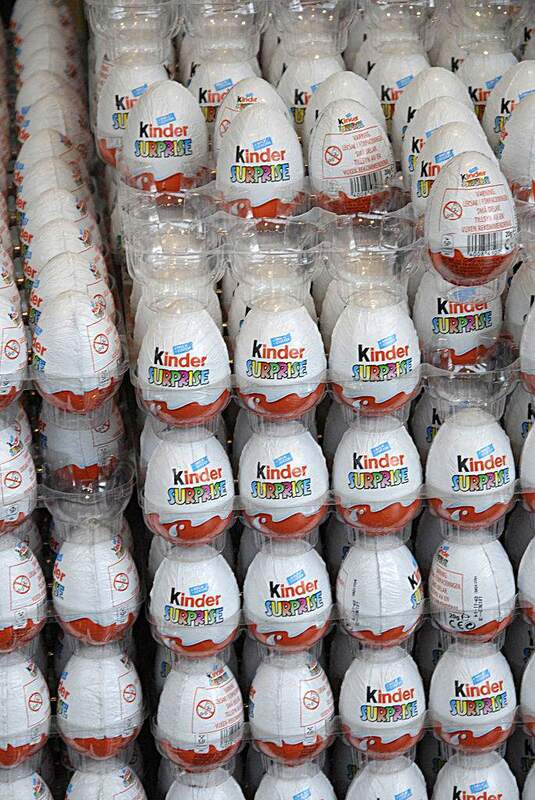 Around 40 billion Kinder Surprise are sold in over 70 countries. Kinder Surprise is a 20g milk chocolate egg wrapped in colorful foil, but the chocolate isn't what makes it kids' favorite. Inside is an assembled toy (safely encased in plastic) that ranges from cars to figurines to limited-editions like Christmas collection complete with baby Jesus. The tiny paper warnings list the choking hazard in multiple languages as well as assembly instructions. They may also provide adhesive decals to personalize your toy. The combo of treat and sweet has proven a winner and Kinder Surprise is a favorite for German kids. The toys have even earned a cult following among adults as collectables. Super fans even collect the instruction manuals ("BPZ" or Beipackzettel in German). Just look at online auctions for these items and be amazed. Why Kinder Surprise for Easter? The candy has proved popular year-round, but is especially associated with Easter, perhaps because of its iconic egg shape. The chocolate egg now comes in a variety of sizes from the standard 20 gram to those the size of a real baby. Why are Kinder Surprise illegal in the USA? One of the reasons Kinder Surprise have garnered such an infamous reputation in the USA is that they are technically forbidden. Under US federal law, it is illegal to have objects within food products. The toy and paper have been cited as a choking hazard. Even trying to open the company's website on Kinder Surprise comes with protective measures. It took me entering my birth date to gain access to the world of Kinder. So...are they actually dangerous? The company does acknowledge two fatalities linked to the forbidden treat, but those incidents happened in the 1980s with small parts that are no longer used. Since then it appears children have managed to eat the chocolates and play with the toys without incident. The toys illegality may change in the future with online petitions showing the will of the people. Ferrero International S.A. has recently said the chocolate egg will be available in the future. However, this may be in the Kinder Joy version where the toy is in one half, chocolate in the other. Can you get Kinder Surprise in the USA? Despite this illicit warning, the chocolate eggs actually aren't a priority for customs. They will be confiscated if discovered (or forfeited) at customs and Kinder Surprise peddlers could be fined, but government agencies have bigger problems. If you are desperate to get a Kinder Surprise into the USA you can probably just pack it in your luggage. Another option is to order the treat online. Sites like BuyChocolateEggs.com cater to the Kinder Surprise obsessed around the world (with the customers assuming legal responsibility). It may be easier to just accept an imitator. The Yowie Group now sells chocolate creatures with a toy-filled capsule inside and Choco Treasure even offers an egg-shaped version. Apparently the fact that the toy comes in one piece and a visible plastic ridge between the chocolate halves is evident is enough to keep the FDA off their backs. If you can't stand anything but the original, there have been reports of finding the forbidden treat of Kinder Surprise in European Markets as well as German and Russian shops.